That’s just what Owly.fm set out to do when they sponsored a stage during the 2018 Vans Warped Tour, the largest traveling music festival in the U.S.
Owly.fm is a loyalty app that gives music fans deals and discounts for concert tickets. With the Owly.fm app, users can earn rewards and credits for attending shows. Since they’re all about the music, getting in front of the Warped Tour audience was a perfect way to spread brand hype to their ideal buyer personas. 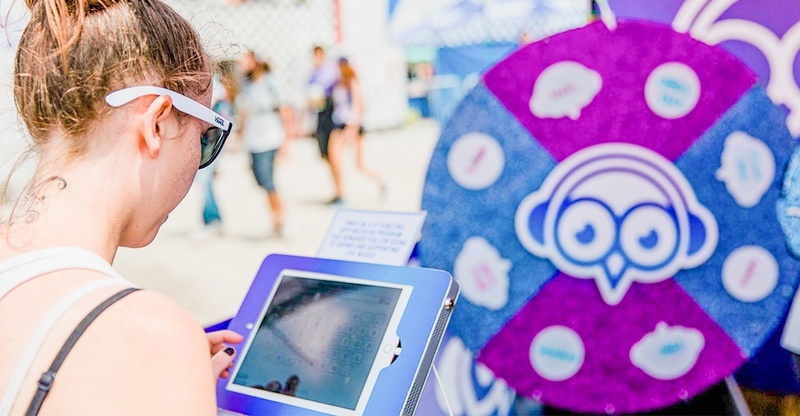 The 2018 Warped Tour sold over half a million tickets across 38 cities, so the opportunity to introduce thousands of people to the Owly.fm brand was massive. When Owly.fm approached Delta Marketing Group about creating some giveaways for the tour, they were looking for a strategic partner that could handle every aspect of the project from product strategy, sourcing and design to shipping logistics. Delta Marketing Group was more than ready to step up to the challenge. The main Warped Tour audience is teenagers, so Owly.fm knew their products needed to be cool. The goal was to provide products the attendees would love to wear and use throughout the event. Owly.fm did not want to simply add their logo to generic products. They used this promotional campaign as an opportunity to create a cohesive collection of high quality branded items that were unique to their company and represented their culture. Warped Tour shows take place outside, no matter the weather. Owly.fm wanted to tailor their giveaways to be helpful to attendees who were spending their day in the summer sun. The imprints for each promotional item in this campaign were custom designed to create a cohesive brand experience and build a remarkable collection of giveaways. Using the company’s owl logo as a jumping off point, we designed creative variations that enhanced and strengthened the Owly.fm brand. The Vans Warped Tour is a traveling music event throughout the U.S. and Canada. Pulling off the strategy, planning, and logistics for this campaign was no easy feat, but the DMG team took on the challenge head-on. The best part? Every single item made it successfully to its destination on time.